The most obvious lie featured in Peterson’s story is that of the counterfeit, the fake drug disguising its true identity and claiming to be something that it is not. In Peterson’s account, however, “fake” is a suitably elastic concept. Next to the product intentionally advertising a false corporate identity (an improperly branded drug), one encounters deliberately or accidentally adulterated generics, truthfully branded products manufactured under substandard conditions (or marketed for the wrong indication), and multiple combinations of all of the above. It is easy to get lost and give up any hope of certainty in this world of pharmaceutical make-believe – elsewhere Peterson has described the unknowability that besets both the participant and the observer of these shadowy market exchanges as a “phantom epistemology” (Peterson 2009) – but Speculative Markets usefully shifts our attention from the elusive identity of products to a more relevant set of questions: what are the mechanisms that sustain this seemingly uncontainable process of speculation on the quality of pharmaceuticals, who benefits from it, and how does it impact those in need of medical care? For the ultimate legal fiction at stake here is not the fraudulent commodity, deceitful as it might be, but the medium through which that commodity circulates: the idea of the market as an abstract space of exchange where supply and demand meet through the mechanism of price to produce public welfare. Peterson begins her book by reminding us that in the 1970s and early 1980s Nigeria was a promised land for multinational drug companies. The oil boom of the 1970s created a new middle class that was attracted by the symbolic value of brand-name pharmaceuticals and had the financial means to afford them. Virtually all the large North American and European companies established operations in the country, opening manufacturing and packaging plants and nurturing a professional class of pharmacists, managerial cadres and marketing representatives ready to supervise the flourishing West African market on behalf of Big Pharma. It is striking how much the Nigeria of this period approximates current Big Pharma expectations of new profit-generating “emerging” markets. These days one can easily find references to Nigeria in consultancy brochures and investor conferences extolling the prospects of “frontier,” “second-tier,” or (in a typically ingenious neologism) “Pharmerging” markets (e.g. IMS Consulting Group 2013). What seems to have been forgotten in these anticipations of corporate opportunity is the fact that such a market did exist in Nigeria not very long ago, that a version of this pharmaceutical future is already behind us. And there seems to be even less recollection of the causes that brought about its demise. As Peterson notes, this Big Pharma utopia was destroyed by a combination of structural adjustment policies and military dictatorships that disenfranchised, impoverished and ultimately decimated the (relatively) affluent consumer class that could have sustained the expansionist plans of multinational companies. Peterson spends considerable time detailing the destructive impact of the IMF-enforced adjustment program on the institutions and social fabric of the pharmaceutical trade in the late 1980s and early 1990s. Currency devaluations quickly wiped out the margins of multinational companies, since they imported drugs and raw materials from abroad, but set their turnover targets in US dollars. In the meantime, and more importantly, the precipitous decline in the standards of living shrank the pool of potential consumers and thereby eliminated the rationale for further rounds of corporate investment. One after the other, Big Pharma companies divested themselves of their Nigerian operations, repatriated most of their foreign personnel, and sought more profitable investment opportunities elsewhere. The rest of Speculative Markets is dedicated to describing the intricate and fascinating trade system that replaced the multinational brand-name drug market so thoroughly dismantled by the “liberalization” policies of the 1980s. This is, first of all, a market awash with drugs, but drugs that are rarely produced in Nigeria, or even Africa. Instead, pharmaceuticals arrive from all over the world through circuitous routes that often involve plenty of lateral exchanges and “round-tripping.” Generics (a category that has here little, if any, regulatory meaning) dominate, and are sourced primarily from Indian companies or their subsidiaries. The little indigenous manufacturing there is relies on the importation of raw materials, primarily from China or through Chinese suppliers, since, despite being a huge oil producer, Nigeria lacks the refining capacity to produce its own chemicals at competitive prices (this is, incidentally, one of the few books that begins to disentangle the profound connections between the oil and pharmaceutical economies). One of the locations where these global flows materialize is Idumota, the largest open drug market in Lagos and a key off-loading point for drugs entering the country. Some of the book’s best pages are dedicated to visiting and revisiting this bewildering place and the people who make a living in it. Created by Igbo traders displaced in the aftermath of the Biafran War, and surrounded by a thriving popular economy of petty trade and informal credit, Idumota is today the epicenter of pharmaceutical wholesaling in Lagos and a key node in the West African drug distribution network. Peterson’s attention to the location of pharmaceutical exchange in the interstices of urban life brings to mind Jean-Christophe Agnew’s famous account of the creation of early modern markets (Agnew 1986). According to Agnew, the physical and symbolic segregation of markets to extraterritorial spaces – liminal settings that markets often shared with spaces for theatrical performance (another domain where the ratio of lies to deception is unusually high) – was instrumental in making the sphere of economic exchange (like that of dramatic representation) a “world apart,” a separate domain unable to contaminate the rest of the body politic. Eventually, the market would cease to describe a specific physical location and came to designate a “placeless process” traversing social life – a process whose depiction (and domestication) became the hidden subject matter of much of English Renaissance theatre. Peterson constantly relates the movement of pharmaceutical commodities to specific points of exchange, and in so doing puts the market back in its place. This place is not the geographically or symbolically segregated spaces of which Agnew spoke, but the always-shifting cleavages between official and unofficial domains that characterize life in the contemporary African city. Struggles to define and captures these intervals thus become central to the distribution of power over pharmaceuticals and their circulation. In a section that is almost comical, Peterson recounts the efforts of Nigerian authorities to suppress the “open” drug trade in Lagos, efforts that were thwarted by the courts’ designation of Idumota as a residential area. In other words, the largest site of pharmaceutical exchange in the city is legally not a market, and is effectively beyond the jurisdiction of official authorities. Underneath the entrepreneurial exuberance of the Nigerian drug trade, however, lie deep-seated inequities. There is, at the heart of the system, a structural discrepancy between medical needs and available treatments. This discrepancy is not the result of immoral behavior – evil counterfeiters flooding the market with substandard drugs, greedy multinationals withholding essential therapies, corrupt officials turning a blind eye to adulterated products, etc. – although there is plenty of that to be sure. The mismatch is rather the consequence of a market organized around a single and consistent imperative: the capitalization on continuous and seemingly capricious price movements through multiple strategies of “chemical arbitrage.” In the absence of effective market supervision, or of any mechanism linking pharmaceutical marketing to public health criteria, the volatility of prices is reflected almost immediately in a parallel volatility of drug chemistry and dosages. The result is a proliferation of drugs that deviate from standard ranges, or are quickly renamed and rebranded to capture short-term price differentials in parallel markets. This is a speculative logic that unfolds and expands without bounds, and without regard to medical needs or changes in the local biologies of disease. In conclusion, Speculative Markets tells a remarkable story of market creation, destruction, and rebuilding. It is a clear-sighted, hard-hitting book, but not a despairing one (it ends, in fact, on a distinctively optimistic note). It is also a book that demonstrates the contribution that ethnographic research can make to our understanding of the lives of pharmaceuticals, in particular by addressing an intriguing but often neglected question: what happens to drugs after they leave the manufacturing plant, but before they are consumed and metabolized by human bodies – when they are nothing more (and nothing less) than circulating commodities. Peterson’s book takes us on a journey that reveals all the complexity that hides behind the term “circulation.” It is not an easy ride, though, and at times the reader (at least this one) gets lost trying to navigate the labyrinthine trade routes and complex calculative strategies that structure the Nigerian drug trade. But maybe this sense of disorientation is appropriate. We experience, in a vicarious way, the epistemological mayhem that confronts anyone who enters this world of pharmaceutical speculation and tries to make profitable sense of it. Javier Lezaun is James Martin Lecturer in Science and Technology Governance in the School of Anthropology and Museum Ethnography, University of Oxford. Agnew, J-C. (1986) Worlds Apart: The Market and the Theatre in Anglo-American Thought, 1550-1750 (Cambridge: Cambridge University Press). Fuller, L. (1930) “Legal fictions” 25 Ill. L. Rev. 363-399. IMS Consulting Group (2013) Pharmerging markets: picking a pathway to success. Peters, K. (2009) “Phantom Epistemology,” in James D. Faubion and George E. Marcus (eds.) Fieldwork is Not what it Used to Be: Learning Anthropology’s Method in a Time of Transition (Ithaca: Cornell University Press). Lezaun J. Kristin Peterson’s Speculative Markets: Drug Circuits and Derivative Life in Nigeria. Somatosphere. 2015. Available at: http://somatosphere.net/2015/kristin-petersons-speculative-markets-drug-circuits-and-derivative-life-in-nigeria.html/. Accessed April 24, 2019. Lezaun, Javier. 2015. 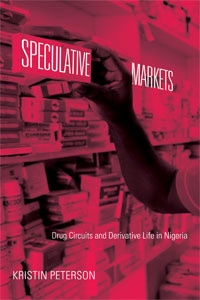 Kristin Peterson’s Speculative Markets: Drug Circuits and Derivative Life in Nigeria. Somatosphere. http://somatosphere.net/2015/kristin-petersons-speculative-markets-drug-circuits-and-derivative-life-in-nigeria.html/ (accessed April 24, 2019).